The schooling year has started for most children in Australia this last week. We haven’t started back officially homeschooling yet as I tend to take the first week to prepare for the coming school year. Usually over January I get the opportunity to dejunk the house and clean out and do an overhaul on the schooling resources. Due to the ‘Books 4 Cambodia’ project and being very busy with that, I have skipped the dejunking until later in the year and have concentrated instead on just preparing a few resources. I have found some great maps and geography questions on the internet for some new geography games. Basically a map of the world with lines to different countries and spots for counting and making up some really interesting questions about different countries, of which the kids have to guess where in the world it is and then throw the dice to travel there on the map. As a family we love finding out more information about different places in the world. For parents in Australia, there is a National Geography competition coming up in March, costing $3 per child to register, that would be a great experience for your kids to do if they love geography. Google ‘Australian Geography Competition’ (www.geographycompetition.org.au) for more information. Last week at church (Stairway Church), the kids were fortunate to be involved in a two hour session on ‘Praying for your school’. This was a fantastic and very creative morning of being actively involved in praying for all aspects of school life in a creative manner. Last week’s blog post included some of these ways. One was writing a thank you letter to the Principal of your school, another was making a prayer box with names of people at your school on slips of paper inside it etc. My kids enjoyed being involved in this and, even though we homeschool, it was still very applicable. I encourage you parents to make full use of opportunities like this to help you in your child’s spiritual growth. The other major event for the week was in hubby taking the children to the funeral of a seven year old daughter of a guy he had spent a bit of time with about twelve months ago. The funeral was a celebration of her life and our kids enjoyed themselves and kept remarking how it seemed like a wedding. There was a jumping castle, face painting, fairy floss, ice cream van and buckets of lollies to scoop up your favourite lollies into bags to take home. A very memorable celebration of a girl who is now dancing with Jesus in heaven. It doesn’t take away the pain her family must be experiencing but it helps to view it in the eternal perspective. It has helped me to look at things this week in relation to my parenting and to see if I have not only a ‘big picture/eternal’ view of things but also to realise that I need to treasure the little things, taking time to cuddle and read and just spend quality time with my kids. The kids have put all their lollies in a container and take one out each day to eat and at the same time are praying for this girl’s family as they grieve and try to come to terms with their loss. 1. “Biggles & Co.” by Captain W.E.Johns, (Flying Ace Squadron-Leader James Bigglesworth was a fighter pilot in the war but now the war is over, he takes on dangerous flying jobs, solving mysteries along the way.) Part of a series. Hubby is reading this to Matey so I am not up on what it actually contains. 2. “Encyclopaedia Brown” by Donald J. Sobol (Encyclopaedia Brown is the 10 year old son of the chief of the Idaville Police Force. Every crook gets caught in Idaville since Encyclopaedia solves the cases, usually over dinner. Great little mysteries that give you an opportunity to solve the case yourself). Part of a series that I would definitely recommend. A favourite in our family for Princess (10) & myself as well. Usually obtained from second hand shops or Book Depository. 3. “Secret of the Shark Pit: A Ladd Family Adventure” by Lee Roddy. Written from a Christian perspective, 12 year old Josh is always on a new adventure. It brings different parenting issues into play eg disobeying your parents can get you into big trouble etc. I don’t find this an easy series to read aloud due to the inclusion of a lot of speech by the characters and superfluous descriptions but Matey seems to find it very exciting. 4. “Tintin in America: The Adventures of Tintin” by Herge. 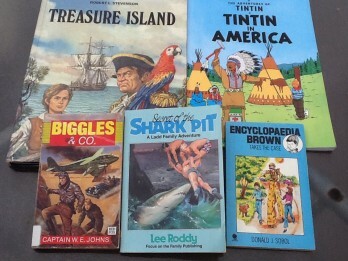 A comic picture book series for early readers that has Tintin and his dog Snowy getting into all kinds of scrapes and nearly getting killed, but Tintin always seems to manage to be the hero and help capture the crooks, usually no thanks to Thompson and Thomson, the two detectives. Great series for kids. I would love to have a dollar for every time I have had to read Tintin to Matey. Both Princess and Matey love this series. 6. “Robin Hood” by Archie Oliver. This is a favourite book that Matey keeps coming back to. I find that I can enlarge my children’s world by what I read to them. I want them to be adventurous, try new things, explore, be able to cope in emergencies and find life exciting, thus I tend to read these sort of books to my children. What books do you read to your children? What are your children learning from them? I am always on the lookout for great books for my children, so please let me know your children’s favourites.